Titon Holdings is a very small cap British stock that makes window fasteners and ventilation systems for sale in the UK and South Korea. The majority of operations are in the UK but the South Korean division has been growing steadily. The main issue with Titon is that the operating business has been struggling and continues to struggle. Valuhunteruk has an excellent writeup on Titon located here. 1) The strength of the balance sheet, especially the makeup of the working capital. 2) Ensuring the operating business isn't destroying the margin of safety. The first thing that stands out is that Titon isn't trading at much of a discount to NCAV right now. The second is that while the company has more than 50% of its market cap in cash the makeup of the working capital is heavy in receivables and inventory. It's not unusual to see a high percentage of inventory or receivables for a manufacturing company, if the opposite were true I would be concerned. In summary the balance sheet is nothing spectacular but the stock is trading slightly below working NCAV giving us a slight margin of safety. The margin is only safe if the operating business isn't generating losses or engaging in recklessly consuming cash. In the case of Titon our margin is barely secure. When I first investigated the business (and subsequently purchased) they had 3.85p in earnings on top of a similar NCAV. At the time the company stated that they were experiencing challenging business conditions which they expected to last for the near future. When reading that I presumed they would be able to continue at a relatively similar earning power, the presumption was an error on my part. As of the latest interim statement Titon had an operating profit of £9,000, compared to £128,000 last period. Net profit was boosted by the following items, investments in associates (South Korea operation), a tax credit, and finance income. Net income was £62,000 compared to £80,000 in the last period. While the current profitability picture is poor the cash flow picture is a bit better. While operating profit was £9k, cash from operations was £298,000. Capex came in at £228,000 giving us a basic FCF of £70,000. It's interesting that FCF is higher than net income. The tailwind to operating cash flow is a large amount of depreciation. The last item I want to mention from the cash flow statement is the payment of dividends. This past period Titon had to dip into cash reserves to the amount of £98k to cover the dividend. This could be viewed as a negative but I actually view it as a complete non issue. Let me explain; paying a dividend out of cash reserves lowers the NCAV by distributing cash to shareholders. For a business like Titon which earns a poor ROE I would prefer for them to distribute some of their cash to me instead of squandering it in the business. 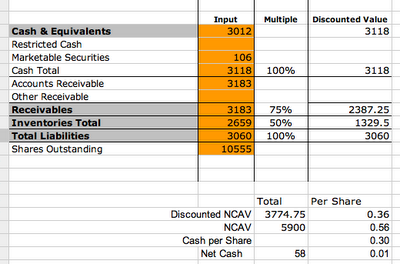 Paying a dividend out of reserves is a small tangible realization of NCAV for the shareholder. This is especially true where the cash isn't needed for operations which is the case of Titon. In summary while business conditions are deteriorating the company still has a secure margin of safety. It's worth considering if the margin will remain secure going forward but for now the safety holds. -It's plain the market has extremely low expectations of profitability, this on top of the poor recent results has left the price depressed. -The company is extremely small and has limited visibility in the market. My view on the value of Titon has changed since the last period report. Previously I had given credit to the operations as kicking in some to the value, but this can't be counted on anymore. The downside in my opinion is NCAV of £.56. While business results currently are poor I don't think the operations are worth zero which is the value the market is assigning. The reason I say this is that given new management and possibly a new sales team margins could possibly be increased and profits could return to the more normalized averages. Over the past five years the average earnings are £.032, which if we assign a 50% discount for poor business conditions and a 10x multiple gives a business value of 16p. Together this is a share value of 72p. If we value based on the FCF average over the past five years of 3.2p at a 10x multiple the operations are worth 32p if conditions improve. We can give a similar 50% discount and end up with the same value as above. The flaw with both of these valuations is that we're betting on the future for the value of Titon to be realized. While I'm not happy with how my investment in Titon has turned out so far I'm not giving up hope. The company has a history of higher earnings in the past and I'm hoping management can turn the ship around. I've been thinking about TON again recently. To me, TON is one of a number of UK-listed companies with absolutely terrible capital structures (MOSB is another one that stumbles to mind). What is more puzzling is that it doesn't have the dual-class share structure which seems to be used by other similar companies to protect them from outsiders. Either way, whilst the company does have operational problems, I think they are more to do with bad management than anything else and can be solved. Since 1992, there have only been two years of losses. Operations are valued net of cash around £2.7m. I haven't gone through the maths fully but even a small amount of debt (maybe just an overdraft facility)would see the value of operations double at least. I just can't see how it makes sense to keep all that cash. So its a real shame as there is a massive amount of value to be unlocked here. Thanks for the comment, I'm not very familiar with the dual class structure but I'm guessing it's a class with super voting privileges and a second class with little to no voting rights. Maybe it's a cultural thing but I would much prefer straight shares, if someone wants to take over the company at a premium and help realize the value I'm happy to oblige. As for the capital structure I could agree to a point, my issue is if they took on debt I'm not sure if they have enough of an operating buffer to support the interest payments. As seen in the last period results dropped off, with only £9k in operating income they would have probably been in default of their debt, or had to tap into reserves to pay the interest. I'm not sure how many banks will loan money to an entity that has the possibility of a real liquidity crisis scenario. I would personally love to see a management shakeup, unfortunately with companies like this it doesn't usually happen. And Titon is a bit too small for an activist to come in, but the company is ripe for a shakeup. Seahawk Drilling, value in bankruptcy?